Festival begins at 2 p.m. | Race begins at 5 p.m.
Great Food, Pony Rides, Games, Clowns, Face Painting, and More! Watch 25,000 rubber duckies float down the Conestoga River in an exciting race for fabulous prizes! 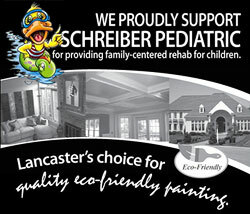 Joel’s Painting supports the Schrieber Pediatrics Rubber Duckie Race.